The tank uses custom software to handle gait control, and there is also a Unity 3D pipeline for modeling and playing back sequences of poses (animations) derived from a 3D model. The tank can be controlled via PS3 joystick, but it also has some degree of autonomy in that it can detect and track faces. The information on the site doesn’t go too deeply into the nitty-gritty technical details, but there are plenty of excellent photos of the construction process. This isn’t the first time someone has been inspired by Ghost in the Shell; we’ve also seen a working Tachikoma made with LEGO that drives and walks just like in the show. Fans might recognize poses and movements done in the video as being re-created from scenes in the show. Well spotted, sir :) It actually roughly 1 to 1 sequence – both robot moves and camera angles. It’s just Motoko shots removed. Camera angles too? That’s some real attention to detail! This needs to remove the servo sounds that kill the mood, apart from that, it’s nice. I’ve never seen the show/game. I like the servo noise. Makes it harder for it to sneak up on me! I usually skip these articles but something, I’m not sure, caught my attention. I want it. It would gaurd my garden from the chickens and the raccoons! You should be able to deaden the noise easily. A little foam goes a long way! Nice monster that you have made. ;) My cat and dog would run away if they saw that! _I_ would run away if I saw that! Actually, I would hit it with a stick first, THEN run away. Creepy. Well done. Maybe you could lower the frequency of the audio to get that big machine sound? Or make it heavy enough for the booming THUMP from putting its legs down, as is the case of its bigger brother! ADD the thump noise with a speaker! Seriously, this is win all the way! A great job hiding all the servos and the cables. I forgot it was a machine! I mean, come on. It sounds like a rattlesnake! Very nice, and the motion is very spider like, very creepy. That thing looks alive. I had a “KILL THE BUG” reflex. I’m sorry, I couldn’t read this just because it said movie. While there are several movies, GitS will always be a TV serial anime. Their on what the 5th series of the show now, with each series having at least 3 seasons. 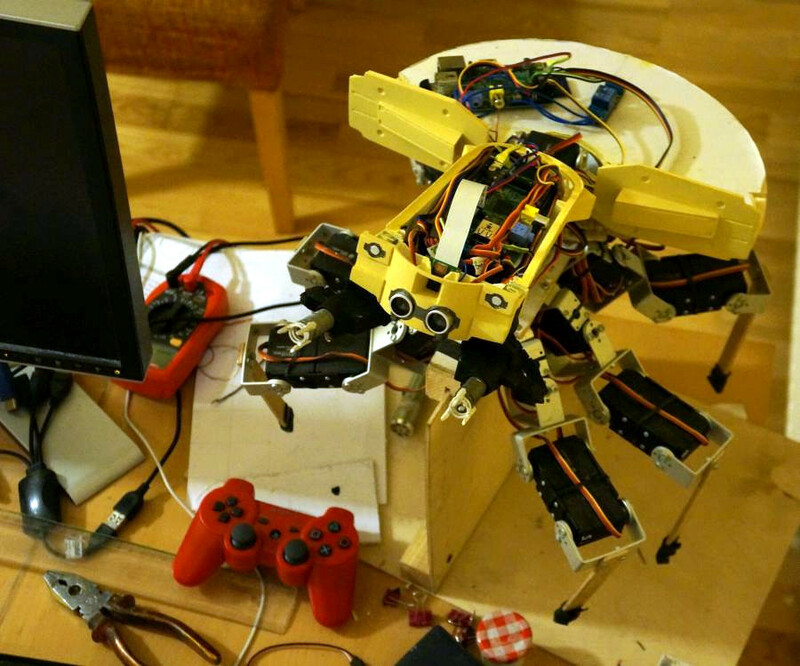 Great job to the guy for making the robotic prop, but :( to the author of this article. Don’t blame the author – the mistake would be mine. Ghost in the shell will always be a TV series? Turn in your nerd card and leave! You’re no longer welcome here. But seriously.. the best way to enjoy Masamune is by reading. Prolific note taker and science geek. The graphic novels are littered with comments and references which support his science fiction as science fact. The MOVIES have the best animated artwork anywhere. I have neither the time nor inclination to point out all the other errors you made, but I might suggest that next time you try to be condescending you make sure you have some idea what you’re talking about first. OFFTOPIC: Is vimeo working for anyone in firefox (for linux) ? It’s almost half year it stopped working, noone brother at vimeo fixing it? I have no idea. I don’t use Linux (yet). Is complete gibberish to me, but the forum has ideas. Works fine for me on Debian Jessie using Iceweasel (Firefox) 38.8.0, no Flash plugin. I believe Vimeo is in the process of converting all their videos to HTML5, but will still try to serve Flash in some situations. Maybe that’s the issue? Worked fine for me. Are you still using Flash? Now this needs to be scaled up a bit more and would be awesome to have walking around your house. I would absolutely die to have a cute blue think tank with an Amazon Echo or Siri like cloud based system to have a little gidgit to have around the house.